Dock lights available at PVCStrip.com are designed to illuminate loading dock areas and expedite workflow. Loading dock lights are key safety products that direct light into trailers and keep forklift drivers and personnel safe from potential injury. Dock lights can be maneuvered into a trailer when in use and just as easily pushed to the side when not needed. 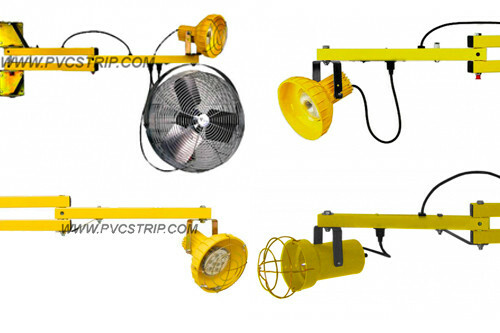 Dock lights from PVCStrip.com are yellow for added visibility and safety. They come in 24, 40 and 60 inch lengths and can be ordered in single swing or double strut configurations. Light head types include LED, metal incandescent and polycarbonate configurations. Metal incandescent dock lights come in all metal construction and use Par 38 or R 40 bulbs up to 300 watts. Wire guards are included. Polycarbonate lights are light weight and resistant to dents, cracks and damage under normal use. They use Par 38 and R 40 bulbs up to 150 watts and are cooler to the touch than metal light heads. Polycarbonate lights also come with wire guards. PVCStrip.com has a complete line of dock lights to fit your needs. If you would like more information, please call 888-303-8515 or contact us.